THE BRILLUSTRATOR: 2nd Sketch Posting! "Go, Spidey, GO!" 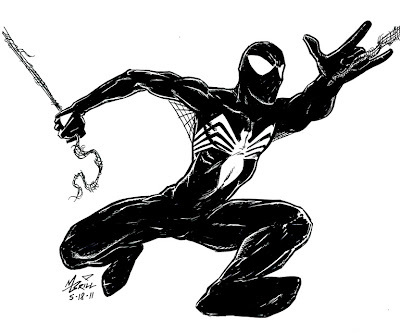 Today's "quick" sketch is the black costumed Spiderman! I LOVED the symbiotic jammies! In fact, the introduction of this costume was what started me buying comics again. I always liked the original costume too, but this was so sleek and elegant. Hell, it was so cool, it LITERALLY took on a life of its own! Anyway, this sketch was another less than successful one. First, there's definitely something wrong with the fore-shortening. Second, It took WAY too long--around 45 minutes! :p I kept fussing with it. In future I need to set a time limit and STICK to it. I should have just stopped after 15 minutes...but I love Spidey and wanted to go ahead and finish it. But this is supposed to be a learning process, so I am posting the fails as well. Anyway--props to Stan Lee, the creator of the Web-head!